We shall discuss in this section about exporting data in Excel. You can convert your Excel workbook in different formats like CSV, txt, PRN, and many more. PRN:Formatted text, printer text file. When you export a worksheet to a CSV file format, the data is saved as displayed. Say you are working with a worksheet in Excel. One of your cells (say it is A5) contains this value: 12.8312344. But you have formatted cell A5 in a way that it shows number with two decimal points. So A5 will show 12.83. Now you want to convert this excel file into CSV format, then A5 will be saved as 12.83 and so on. 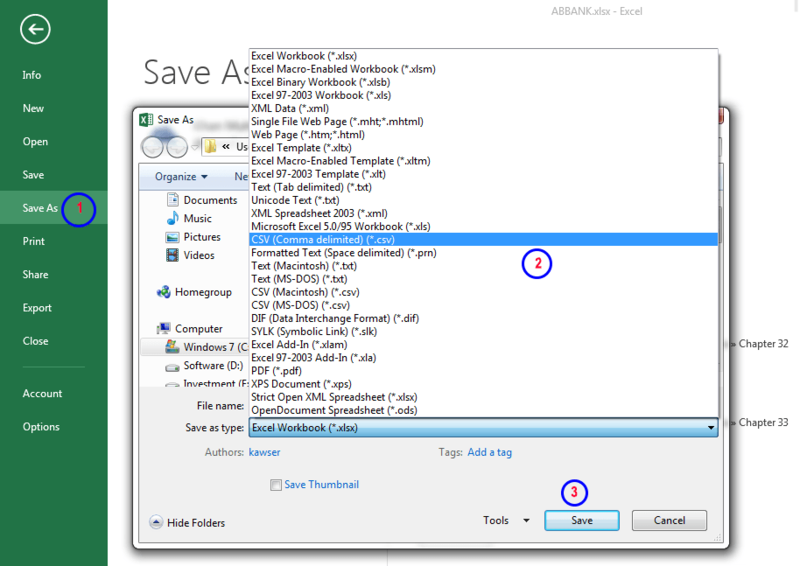 The following figure explains to you how to save excel workbook as CSV format. Save as dialog box. This figure describes how to convert .xlsx file into .csv format. This figure shows you the data transformation when it is converted into .csv format. Download this file and convert it to CSV format. Download this file. 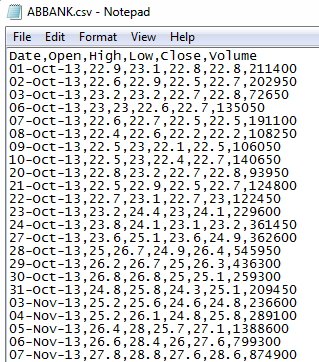 Output of the above file when converted into .csv format. Note: If a cell contains a comma, the cell value is saved within quotation marks. If a cell contains a quotation mark character, that character will appear twice. Exporting a workbook to a TXT file is almost identical to the CSV file format what we described above. The only difference is that cells are separated by a tab character rather than a comma. If your worksheet contains Unicode characters, you must export the file using the Unicode Text. Otherwise, Unicode characters will be saved as question mark characters. A PRN file is like a printed image of the worksheet. The cells are separated by multiple space characters. A line can have at best 240 characters. PRN files are not usually used. DIF (Data Interchange Format): These files have DIF extension. Used rarely. 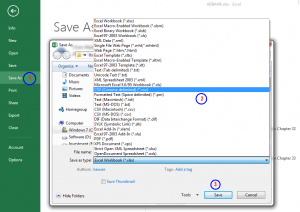 SYLK (Symbolic Link): These files have SYLK extension. Not used very often. PDF (Portable Document Format): These files have a PDF extension. This is very common “read-only” file format. XPS (XML Paper Specification Document): These files have XPS extension. This one is Microsoft’s alternative to PDF files. Used rarely. Web Page: These files have an HTM/HTML extension. ODS (OpenDocument Spreadsheet): These files have ODS extension. These files are compatible with various open source spreadsheet programs.